When I was approached by a client to create a video based on an a new event for kids a whole number of ideas started to flow through my head. But as experience has shown me in the past, Video production rarely goes to plan. 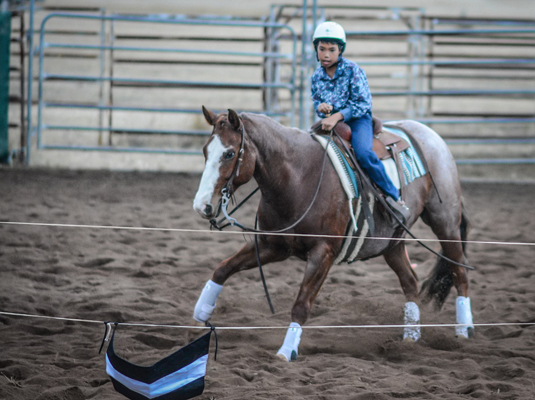 The event is called “Grass Shoots Cutting”, it is an event aimed directly at children to introduce them to an equine sport called cutting. Cutting, although originating from the USA, is very popular here in Australia and involves the competitor mounted on a horse to ride through a herd of cattle and separate one and keep it separated from the herd for a period of time. The Grass Shoots concept replaces the herd of cattle with a machine called a mechanical cow. When originally approached to do this event I had intended to have the final production filled with amazing special effects, music and all sorts of whiz gadgetry thrown into the end product to give a big WOW factor. I had made a mental list of the sort of shots I wanted in my piece and I was prepared and ready to fire! That was the plan anyway …. By the time the weekend was over, I have to be honest, I didn’t think I had the footage required to create a suitable end product. When it was time to video some footage of the event the sun had gone down and the lighting available at the showground was pretty dim. Despite that I pulled my old Sony HDR-PJ430 camcorder out of the kit expecting to arrive home with some very noisy dark footage. The next day it was time to video the interview with the kids, overnight a blustery wind developed and stayed for the duration of the following day. Despite best efforts to record the interview in a protected area the swirling winds made that impossible. On top of that we only had time in between events to make the recording ….. about 20 minutes. So by the time I got home and was ready to view what I had done, I wasn’t feeling very confident. When I first viewed the footage from the nights event I was pleasantly surprised. No noise at all in the footage … my Sony handled the low light conditions admirably. Fortunately the audio on the interview was acceptable too. As I viewed the footage it became apparent to me that the best way to approach this project was just to keep it Raw and simple. It was just about capturing the essence of the subject. I threw all my original ideas of special effects out the window and decided to go back to my film making days when a production relied totally on editing something that was raw and honest. The words of one my Mentors came back to me “You need to capture the essence of what your subject is about”. Armed with that advice I moved myself back in time, back to a time when special effects were very expensive and only used if totally necessary, back to a time where the success of a production was totally reliant on shot selection and placement to capture the essence of that subject. I think this little clip has achieved exactly that. I’m actually very proud of this video. Now I can see the film making purists and the video producers who have thrown copious amounts of money at very expensive pieces of equipment to show their wares, standing there with hands on hips and shaking their heads. That’s Ok I can live with that. The reason I like this video is because it is Raw and Honest and captures the essence of what Grass Shoots Cutting is all about. Just like in the good ole days before technology came to town.